Dr. Reyes is passionate about education research and the craft of teaching. In his writing, Dr. Reyes focuses on Education and Opportunity, particularly on student success for children of poverty. His work has focused on urban students, language learners, migrant students, and border students-all children of poverty. His academic work has transcended the "the blaming game" and has focused on what is possible with these students and their success in schools. Currently, he is pursuing several related questions; the first question is focused on enhancing student learning and education transitions to postsecondary education and adulthood. Four primary research questions are being explored in this area of study: 1) To what extent policy/education reform enhances learning for high poverty children? 2) To what extent policy or organizational factors help or hinder student persistence through high school and postsecondary institutions? 3) Who gains access to postsecondary institutions and why? What is the role of families and others in successful transitions? and; 4) Who eventually completes their postsecondary education and earns some type of degree or certificate and why? Dr. Reyes has authored several books, including Resiliency and Success: Migrant Children in the US (2004); Lessons from High Poverty High Performance Schools: Creating Learning Communities (1999); and Teachers and Their Workplace: Commitment, Performance, and Productivity (1990). In addition, Dr. Reyes has authored numerous scholarly articles, book chapters, and monographs in several prestigious journals such as Educational Administration Quarterly, the High School Journal, Journal of Educational Research, and the Hispanic Journal of Behavioral Sciences. Moreover, he has presented a significant number of papers at national and international academic conferences, and held positions with many scholarly journals, including Editor of the book review section of Educational Researcher and Associate Editor of the International Journal of Qualitative Studies in Education. Dr. Reyes has raised more than 23 million dollars in research development grants from foundations including: The Spencer Foundation, The Annenberg Foundation, The Spencer T. and Ann W. Olin Foundation, the Texas Education Agency, the National Science Foundation, the Houston Endowment, Inc., The Brown Foundation, and the U. S. Department of Education. He is the Executive Director of the Texas Education Research Center. The mission of the Texas Education Research Center is to maintain a longitudinal data system for the State of Texas; and to provide social scientists and other researchers access to such database to study and analyze significant questions to improve educational policy, educational outcomes, and labor outcomes within the confines of a highly secured environment. The Texas Education Research Center (ERC) not only provides access to social scientists to conduct research; but its staff also conducts survey research and evaluation studies, provides technical advice to design high quality studies; offers technical assistance for data management; develops customized training for highly secured research environments; provides graduate students and postgraduate training in longitudinal data systems, and disseminates information to policy makers and educators from the latest research conducted within the Texas Education Research Center. He holds the Ashbel Smith Professor in Education Policy and Administration at UT Austin. Reyes began his career as an assistant professor in the Department of Educational Policy and Administration at the University of Kansas at Lawrence from 1985-87. In the Executive Vice Chancellor role, he was the architect developing the vision and creating a new Institution (UTRGV) which included a medical school. The University of Texas Rio Grande Valley which is located in the most underserved area in the State of Texas. Dr. Reyes was Associate Vice Chancellor for Academic Planning and Assessment at The University of Texas System, Office of Academic Affairs, and effective January 15, 2003 and finished his term in August, 2012. As Associate Vice Chancellor, Dr. Reyes worked primarily in education policy. Dr. Reyes also directed the Student Learning Assessment Project, for the academic institutions, and Academic Initiatives, for Academic Affairs, which included managing a multi-million-dollar fund to improve research infrastructure and capacity among academic institutions. Dr. Reyes was involved with the execution of the University of Texas System's annual tuition and fee plan and annual budget presentations. He served on System Task Forces on issues including capital planning and admissions. Dr. Reyes also served on boards of external education organizations including P-16 Council and the Texas Education Reform Foundation. Prior to his role as Associate Vice Chancellor, Dr. Reyes was Associate Dean of Graduate Studies and Professor of Education Policy and Administration at The University of Texas at Austin from 1996-2003. The Associate Dean assists the Vice President and Dean of the Graduate School on overall graduate academic policy, the administration of inter-institutional collaboration, student recruitment, fellowship administration, and academic graduate program review and evaluation in social sciences and professional schools. He managed multi-million-dollar budget and significant resources for fellowship awards. 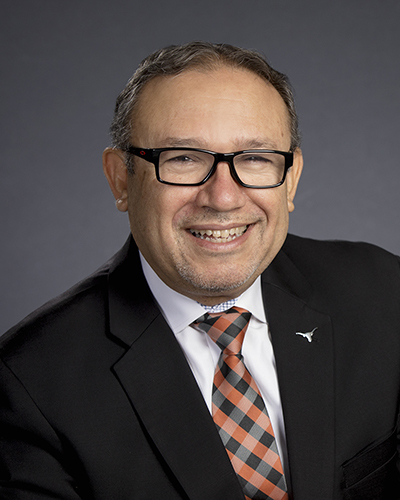 Recently, Reyes finished his appointment as president ad Interim of The University of Texas at San Antonio, and served as the Chief Executive Officer of the University of Texas San Antonio until September, 2017. He oversaw a budget of $550 million dollars. The university enrollment was of 30,000 students; it included 10 colleges and schools fully accredited. It boasts majors research centers, and institutes focused on economic development, community engagement, and an Institute of Texan Cultures that houses cultural and historical artifacts from those who founded the State of Texas. Bringing a career of teaching, research, and administrative experience to his new position, Reyes' work is focused on defining strategic academic goals and priorities to advance university excellence, enhancing undergraduate student success, and developing a vision to integrate the university with the local, state, and global communities. Dr. Reyes received a bachelor's degree in Latin American History and Education and a Ph.D. in Education Policy & Administration from the University of Wisconsin-Madison. From 1985 to 1986, Dr. Reyes served on the faculty at the University of Kansas, Lawrence, after which he returned to the University of Wisconsin-Madison as a member of its faculty, where he stayed until 1990. In December 1990, Dr. Reyes joined The University of Texas at Austin, serving as a member of the faculty of the Department of Educational Leadership and Policy. Professional recognition for Dr. Reyes includes several notable distinctions. The National Academy of Education selected Dr. Reyes as a fellow. In 2007, Dr. Reyes received the Past President's Award for leading the University Council for Educational Administration, a national consortium of higher education institutions dedicated to improving education policy and administration. Dr. Reyes received the Distinguished Faculty Award from the Texas Association of Chicanos in Higher Education. He has also been named to numerous national committees to review the quality of university programs, such as the Ohio Board of Regents Review for Education Programs. Dr. Reyes is married to Gloria C. Reyes, a former kindergarten teacher. They have two adult sons, Pedro Jr., who works for Travis County and Adalberto Damian, who works with the federal government. They reside in Austin and San Antonio respectively. In his spare time, Reyes enjoys reading and travelling with his family. Museums are always at the top of the list of destinations. When not at work, Dr. Reyes enjoys teaching and playing with his grandchildren. Kaitlin's research interests lie at the intersection of higher education, policy, and economics with a particular focus on state-level polices and practices. Research areas of interest include the connection among high school preparation, postsecondary education, and labor market outcomes within Texas, how characteristics of students and/or institutions affect postsecondary persistence and completion, and patterns in high school and postsecondary course consumption as it relates to Texas state policy. Michael's research interests include the intersection of schools and communities, children's geographies, and methodology.